Latch & Door Design. Latch & Door models feature non-binding nylon inserts and anti-seize lubricant for a lifetime of trouble-free use. It allows the motor to remove quickly and easily for safe storage. Tilt/Extend Tiller. Get the best of both worlds on your hand control motor with the new Tilt/Extend Tiller. 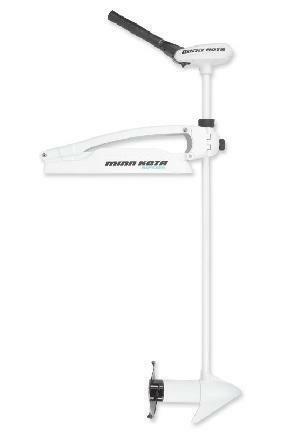 It can both tilt (up to 45°) and extend (6") to fit the way you fish. Digital Maximizer. Digital Maximizer controls and optimizes power to extend battery life and reduce damaging heat. You’ll stay on the water up to five times longer on a single charge. Weedless Wedge 2 Prop. Push weeds away and take on the thick stuff without battery-draining chopping and hacking. Weedless Wedge™ 2 features swept-back, flared blades for unrelenting, reliable prop performance. Full Encapsulated Electronics. Marine-grade urethane fully encapsulates Riptide control boards to protect the electronic circuitry. Also, all electrical connections are sealed with liquid-tight heat shrink tubing to form an impregnable barrier against saltwater.